With recycling market values falling and operation costs rising, the recycling industry is seeking ways to ride out the market’s ups and downs while continuing to provide this crucial component of municipal waste management. One contributing factor to the cost of recycling is the rise of single-stream recycling which leads to increased contamination and loss of the unusable recyclables. Contaminated recyclables increase costs for recycling companies because salvageable materials must be removed by hand and cleaned, contaminated materials must be landfilled at a cost, and equipment must be repaired due to contaminants “gumming up” the works. 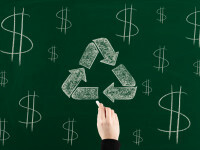 While the recycling industry makes plans to ride out the ups and downs of the market, educating consumers about recycling issues is key to the success of local recycling programs. Residents must understand what can be recycled in their community, how to properly prepare recyclables, and the true costs of recycling. Their understanding of all three are vital to the livelihood of municipal recycling. For more on information that needs to be shared about recycling, check out the National Recycling Coalition’s recent post.